Christmas morning is a time for family, not for toiling in the kitchen, but that doesn't mean your first meal of the day can't be holiday-worthy. Start the holiday off on a stress-free note with these extra special make-ahead and super-quick breakfast dishes. 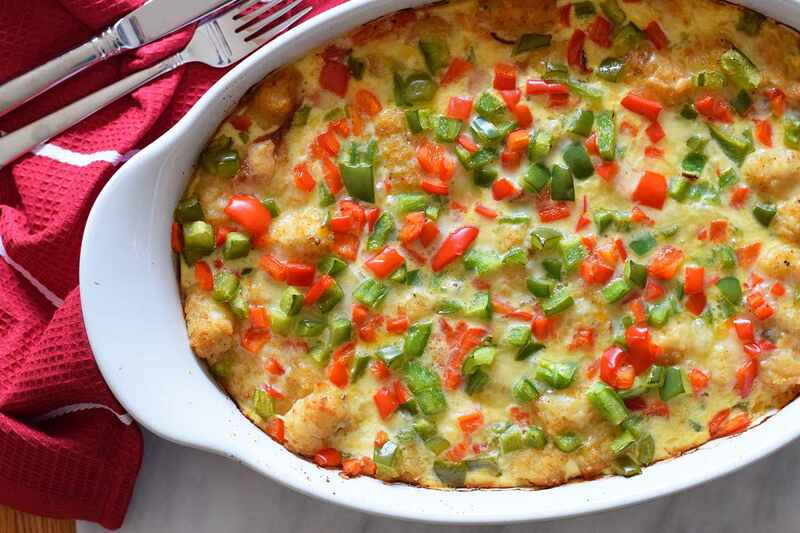 Filled with eggs, tater tots, ham, bacon, and cheese, this breakfast casserole is a whole meal all on its own. Mix everything up the night before, cover, and stash in the fridge. Pop it in the oven when you wake up, and you'll have a hot dish to serve in no time. Serve with make-ahead biscuits for an extra special—and filling—meal. A Swedish tea ring is like one giant cinnamon roll, beautifully stuffed with dried fruit and nuts. You can make this recipe a day or two in advance and bake it on Christmas morning, or eat at room temperature with steaming cups of coffee as you sit by the tree. Frittatas are somewhere in between a baked omelet and a crustless quiche, and they come together lightning fast. Add a little crumbled, cooked sausage or bacon if you want extra protein, or top with a big sprinkle of cheddar or Parmesan cheese. Imitate the texture and flavor of a cheese soufflé with simple white bread, eggs, milk, and cheese. Sharp cheddar or another flavorful, melty cheese is best, and the casserole only gets better when it rests overnight. Simply bake in the morning for a warm, savory treat. Instead of shaping and cutting individual sausage sandwiches, this biscuit bake has the fillings mixed right in. You can whip it together in less than 20 minutes and store it in the fridge until Christmas morning. Pop it in the oven and you've got an easy, no-mess breakfast that everyone will love. Don't brother cranking up the oven—these cinnamon rolls cook to tender, spiced perfection in a slow cooker. You can prepare these a couple of different ways to make your morning easier: get the dough ready the night before and let rise in the fridge overnight before rolling out and cooking while you open presents. You can also prepare and roll up the dough and chill before cooking in the morning. Roll up these beautiful bacon, egg, and cheese croissants with loved ones on Christmas Eve, assemble them on a tray, and pop them in the oven in the when you wake up. They're a hot, tender, and delicious all-in-one breakfast. You don't even need a plate! Quiche is equally good at room temperature as it is hot, making it an ideal make-ahead dish. Bake the night before and reheat, or enjoy as is. The green broccoli and red tomatoes make this egg dish especially festive. A decadent French toast bake is perfect for a busy holiday morning. Assemble it the night before, cover, and chill. Bake in the morning for fast and easy breakfast that's warm and satisfying. Don't forget the syrup, or serve with cranberry sauce to match the occasion. Individually-sized and full of fruity flavor, homemade toaster pastries are a real treat. You can make them the night before and eat as is or prep the dough the night before and stash in the fridge. Let it warm up a bit on the counter before rolling out and baking on Christmas morning. Use red and green sprinkles to give the tops a festive holiday look. Biscuits and gravy are the ultimate Southern comfort food. Prepare the dish ahead of time and store in the fridge, reheating just before serving. The fluffy texture of the biscuits soak up the meaty, peppery gravy. 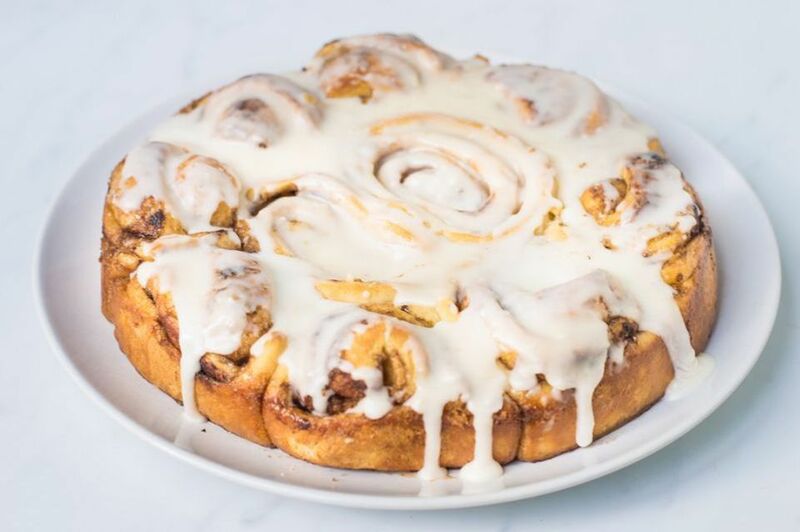 Cinnamon rolls are always a family favorite. Make the dough and roll them ahead of time and store in the fridge. Come morning, all you'll have to do is toss the tray in the oven. No one can resist the ooey, gooey texture, warm cinnamon spice, and sweet icing. These Danishes feel like a real treat, but come together in a flash thanks to frozen puff pastry. Make them the night before for an instant breakfast, or have them ready fresh in about 30 minutes. Replace the blueberries if desired with raspberries, cherries, or blackberries, or use a mix of your favorites. Make a breakfast worthy of a holiday morning with a tender quiche filled with crab meat and Swiss cheese. Bake the day before and serve at room temperature or warmed with a side of fresh fruit or a cup of warm cider. The combo of cranberry, orange, and pecans makes this tender quick bread holiday-worthy. Make and cool the loaf the night before and ice it that night or the next morning before serving. Because it's so moist, it'll taste just as good the next day. Packed with flavorful sausage and melty cheese, this bread can be made entirely ahead of time. It's especially quick to assemble if you use store-bought dough. Reheat in the oven when you're ready to eat or serve at room temperature. Pumpkin season isn't over after Thanksgiving ends. These moist muffins are studded with chewy, sweet dates and topped with a crispy, spiced topping. Make them the night before and reheat in the oven or microwave, or have them ready start to finish in a little over half an hour.